One of the greatest show in New Mexico, the State Fair is far more than just an agricultural show. Professional rodeo events and the showing of livestock are big drawcards, or course. 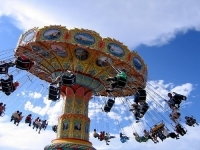 But fair-goers also flock onto the 236-acre fairground in the heart of Albuquerque for everything from corn on the cob and cotton candy to carnival rides. The fair also includes arts and crafts, various animal events, concerts, and a variety of free entertainment.